In December of 2017 I was working on a Java EE web project from my startup. One of the first things that needed to be defined was where to host the application. After studying Heroku, Openshift, AWS and Google Cloud, I decided to use Docker containers on Google Cloud infrastructure. Google Cloud with Docker container lets you use all the power of the Java EE stack. It has low prices, ease of configuration, scalability and platform independence. As it was a private project, I chose to use Bitbucket because it has Git and pepilines to do the integrations with Google Cloud and Slack. Go to your repository settings in Bitbucket and navigate to Pipelines > Environment variables. Create a new variable named GCLOUD_API_KEYFILE and paste the encoded service account credentials in it. Add a new variable called GCLOUD_PROJECT and set the value to the key of your Google Cloud project. Add another variable called APP_NAME and set the name of your app. In Pipelines you can configure the build schedule. This entry was posted in Cloud, Container, Docker, Java, JavaEE, Kubernetes and tagged Cloud, Docker, Java, JavaEE, Kubernetes on May 17, 2018 by rodrigopinho. 2) Place your admin-starter.war file in the same directory as your Dockerfile. sudo docker build --tag=admin-starter-app . Application will be deployed on the container boot. This entry was posted in Cloud, Container, Docker, Java, JavaEE on December 16, 2017 by rodrigopinho. Dans mon entreprise, le Scrum a été adoptée comme cadre de développement Agile, et notre équipe a commencé à travailler sur le maintenance de six projets avec différentes technologies. OK, mais comment pourrions-nous travailler sur tous nos différents projets et encore profiter des avantages de le Scrum? Prévoir combien des changements réels que nous aurons au cours du sprint. Estimer les points prioritaires parmi les six carnets de produits, en utilisant Planning Poker. Définissez le pourcentage d’importance que chaque projet aura dans le sprint. Déplacer ces éléments vers la liste de tâches (“sprint backlog”). Au cours des trois dernières années, nous avons eu du succès avec cette approche. Avez-vous fait face à un cas similaire? S’il vous plaît, n’oubliez pas de commenter et partager vos expériences. This entry was posted in Agile, Scrum and tagged Agile, Français, Scrum on July 10, 2016 by rodrigopinho. At my company, Scrum was adopted as our Agile development framework, and our team began working on the maintenance of six projects with different technologies. OK, but how could we work on all our various projects and still take advantage of the benefits of Scrum? Predict how many real shifts we will have during the sprint. Estimate the priority items from among the six product backlogs, using Planning Poker. Set the percentage of importance that each project will have in the sprint. 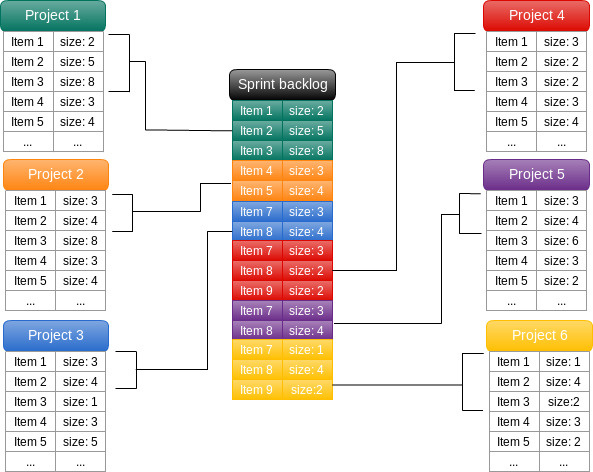 Move those items to the sprint backlog. In the last three years, we have had success with this approach. Have you faced a similar case? Please be sure to comment and share your experiences. This entry was posted in Agile and tagged Agile, Scrum on August 24, 2015 by rodrigopinho.